The PWR-ARM Bimini Top – A Great Addition! Many of us are acquainted with, or have owned a traditional bimini top. The traditional bimini top provides great shade but must be raised and lowered manually. Consequently, in addition to traditional bimini tops, Covers Direct now offers the automatic PWR-ARM made by Schwintek. The PWR ARM Bimini Top gives you the option to deploy or lay back the top with the touch of a button. 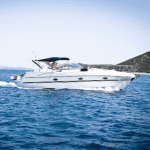 It is a fully automatic bimini top and currently the only one on the market. This top continues to increase in popularity resulting in boat manufacturers including them on new boat offerings. The PWR-ARM truly is a luxury top that adds a touch of style to your pontoon or boat. Will it work for my boat? You may ask, “Will this fit my boat or pontoon?” If you have a mounting width of 92” to 102”, then absolutely! This top can be installed on most any pontoon or deck boat. 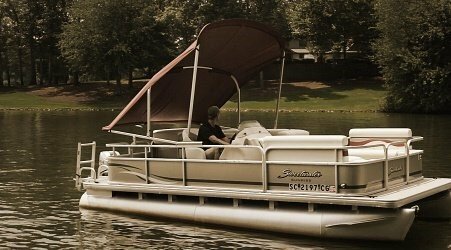 It is made to mount easily to the railing of your pontoon; however it can be installed on deck boats with adjustments made to the mounting surfaces. The PWR-ARM is available in one size; 10’ long and 51” tall. Once you know that the dimensions are right for you, it is time to pick a color. There are 7 colors available. Each can add just the right pop of color to your boat or pontoon. Do you notice something else special about these colors? Each color is currently in stock and ready to ship! With your order, you will receive everything that you need. This includes the frame, canvas, actuators, toggle switch, storage boot and all hardware. If you want to upgrade to add a remote and RF receiver, you may do that too. Another important question you may be asking yourself is, “Can I install this myself?” and the answer is, “Yes!” The PWR ARM package will include a complete guide to installation, and we have posted several videos here, that are great tools to use when installing your top. https://youtu.be/qnqDo6BNNnY, https://youtu.be/iDvjdQ7Ke3I. Add this top to your boat! Add the PWR-ARM to your boat and give yourself that touch of luxury. Sleek, convenient and efficient, this top will make your time out on the water more relaxing and enjoyable. You will quickly go from soaking up the sun to relaxing in the shade. We know that the PWR-ARM is a Boat Lover’s must have! Next: How do you keep birds off of your Canopy Lift! Previous: Fishmaster T-tops: Comfort and Convenience – just how you need it!